Mosey on down to the corral for a trail ride or hayride to the Cowboy Breakfast cook-out where we'll have the biggest, best breakfast ever served on the trail. There'll be eggs by the dozens, hash browns, thick-sliced bacon, cowboy sausage, oven-fresh biscuits and even southern grits. The trail boss always has a special concoction you can wrap a tortilla around and enjoy. There'll be plenty of cowboy coffee and juices to wash it all down. Cowboy Breakfast is daily. Those preferring to eat in the dining room may do so until 9:30 a.m. When you get back to the corral you can take a morning trail ride into the hills or down to the lush cool Medina riverside. Our guests get two trail rides daily -- one in the morning and one in the afternoon. 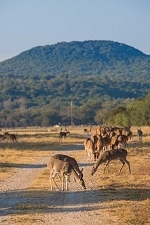 Dude ranch riding is strictly single file at a walk -- the best way to see our Texas Hill Country scenery. Our cowboys are the real thing and will answer any questions you may have concerning riding, the ranch or just philosophy. Lunch is served either poolside or in the dining room. The new Cowboy Dome Pavilion located right next to the pool invites you to enjoy a cool drink, listen to some good old Country-Western music or just get out of the sun and relax with new-found cowboy and cowgirl friends. After lunch it's more horseback riding, swimming, joining in on the various contests, sunning, or snoozing. Or enjoy the peaceful tranquility of the Medina River. 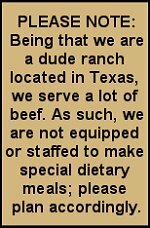 Each night at The Mayan Dude Ranch has its own brand of fun and food from barbecues at the Riverside Gazebo -- tons of brisket and ribs or tenderloin -- to Texas-sized steak at Hicksville (our lttle western town). Sometimes we even dine in the dining room -- a cornucopia of Continental and Domestic cuisines with all the accoutremental salads and side dishes. After a world-class dinner there will be entertainment. One night it might be a country dance, another night a play or musical in the dining room. Time to hit the Goodnight Trail to rest up for the next day's fun. You'll never sleep so well. Next thing you know it's morning again. We have MORE at The Mayan! Tax plus a 10% service charge will be added to your bill. The Mayan Ranch has a strict "NO PET" policy.